Duke University Press, 9780822323969, 328pp. Feminists, socialists, Afro-Puerto Rican activists, and elite politicians join laundresses, prostitutes, and dissatisfied wives in populating the pages of Imposing Decency. Through her analyses of Puerto Rican anti-prostitution campaigns, attempts at reforming marriage, and working-class ideas about free love, Eileen J. Su rez Findlay exposes the race-related double standards of sexual norms and practices in Puerto Rico between 1870 and 1920, the period that witnessed Puerto Rico's shift from Spanish to U.S. colonialism. 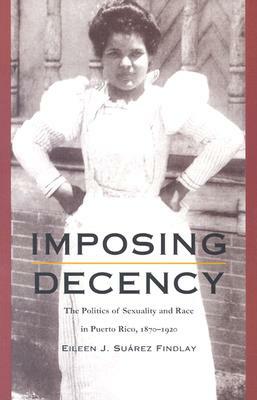 In showing how political projects and alliances in Puerto Rico were affected by racially contingent definitions of "decency" and "disreputability," Findlay argues that attempts at moral reform and the state's repression of "sexually dangerous" women were weapons used in batttles between elite and popular, American and Puerto Rican, and black and white. Based on a thorough analysis of popular and elite discourses found in both literature and official archives, Findlay contends that racialized sexual norms and practices were consistently a central component in the construction of social and political orders. The campaigns she analyzes include an attempt at moral reform by elite male liberals and a movement designed to enhance the family and cleanse urban space that ultimately translated into repression against symbollically darkened prostitutes. Findlay also explores how U.S. officials strove to construct a new colonial order by legalizing divorce and how feminist, labor, and Afro-Puerto Rican political demands escalated after World War I, often focusing on the rehabilitation and defense of prostitutes. Imposing Decency forces us to rethink previous interpretations of political chronologies as well as reigning conceptualizations of both liberalism and the early working-class in Puerto Rico. Her work will appeal to scholars with an interest in Puerto Rican or Latin American studies, sexuality and national identity, women in Latin America, and general women's studies.